"We observed that the optical frequencies of the microcomb interfered destructively over a short period of time, thus providing the formation of a wave inside the cavity that resembled a 'hole' of light. The interesting aspect of this waveform is that it yielded a sufficient amount of power per frequency line, which was essential to achieve these high-performance experiments in fiber communication systems," says Victor Torres Company. The physical formation of these "dark" pulses of light is far from being fully understood, but the researchers believe that their unique properties will enable novel applications in fiber-optic communication systems and spectroscopy. "I will be able to explore these aspects thanks to the financial support of the European Research Council (ERC)", says Victor Torres Company. "This is a bright start to better understand the formation of dark pulses in microresonators and their potential use in optical communications. The research could lead to faster and more power-efficient optical communication links in the future." "Our findings do not represent the first demonstration of a microcomb in fiber communications, but it is the first time that the microcomb has achieved a performance compatible with the strong demands of future communication systems," says Peter Andrekson, who is also one of the co-authors of the paper. 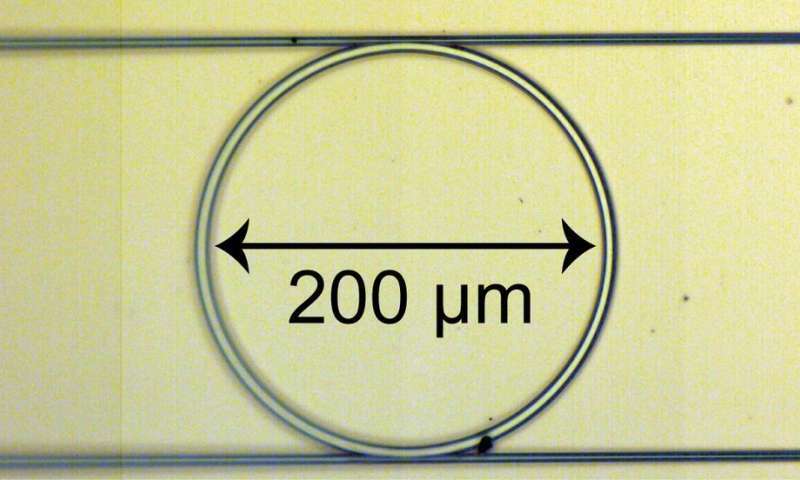 The main author is Attila Fülöp, who defended his doctoral thesis, "Fiber-optic communications with microresonator frequency combs," at the Photonics Laboratory in April. "Working with the microcomb and this experiment has been a great experience. This proof-of-concept demonstration has allowed us to explore the requirements for future chip-scale data transmitters while at the same time proving the potential of this very exciting dark pulse comb technology," he says.